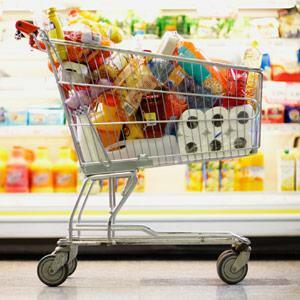 It's a commonly held belief amongst grocery store chains that the further a shopper walks into a store, the more likely it is that he or she will spend more money. But as it turns out, most shoppers actually end up covering less than half the area of an average grocery store, which equates to approximately 1,400 feet (or one-fifth of a mile, for you fitness buffs). So even though you may feel as if you're pushing your cart down aisles for hours, stores actually still aim to get us to walk around even more — and our own smartphones may be helping them accomplish this end. According to a recent report published by the American Marketing Association, in-store coupons and deals sent to a consumer's smartphone can encourage them to walk around more — and in turn, spend more. The AMA study, conducted by Professor Sam Hui of the NYU Stern School of Business, used radio frequency identification (RFID) tracking to conduct a field experiment examining consumers' in-store travel and unplanned spending. Shoppers in the study were sent mobile promotions while shopping (which a regular consumer might receive through a location-based app like FourSquare or a store-specific app), and the group found that the "walking theory" is true. The experiment showed that consumers, on average, spent $13.83 when they were sent a coupon that was for a product near their planned path, but a mobile coupon requiring shoppers to walk outside of their planned path increased unplanned spending to $21.29. In general, walking an additional 55 feet in a grocery store increases unplanned spending by about $1, while strategically promoting three different product categories via mobile promotion may increase unplanned spending by more than 16%. And while the study deals largely with mobile promotions and the opportunity they provide for real-time enticement for shoppers, the more traditional format of printed weekly flyers is designed to draw shoppers into specific areas of a store — outside of their usual path — in a similar fashion. Another area where customers often commit impulse purchases is at the checkout counter, where magazines, soft drinks, and candy are all fair game for waiting customers. Apparently though, mobile has thus far harmed these categories, since people texting and browsing on their phone while on the check-out line are no longer flipping through magazines or throwing a pack of gum into the cart. Feeling the pinch, the manufacturers of these goods are jumping on the mobile bandwagon to remedy this dip in sales, according to a recent Businessweek article. For example, Hearst is partnering with Realtime Media and Prizelogic to offer prizes to consumers in-store. Consumers might text "Cosmo" to enter to win a designer bag or cash — and get a coupon to purchase a magazine on the spot. So how can you combat all these strategic attempts to get you to spend more while at the grocery store? Ellie Kay, family finance expert and author of The 60-Minute Money Workout says to stick to your list unless you can answer "yes" to two out of three of these questions: Do you need it? Can you get it for pennies or for free? Will you give it away to someone in need? Even if these questions don't apply, it's become vital in this economy to take a measured look at all of our purchases. 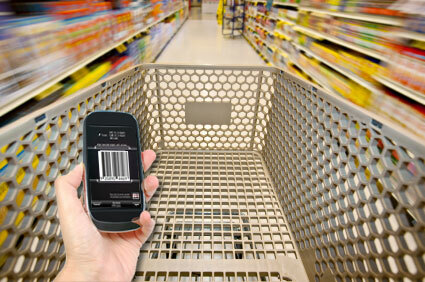 Readers, have you noticed more in-store mobile promotions that extend your grocery store stay? Do you always stick to your list no matter what? Or do you sometimes make exceptions? Sound off in the comments below.